When the history of the Girlsâ High School (GHS) is written, the name Tizzianna Browne will be included. Representing the dance theme âZoukâ, the fourth form student said that she was very happy as well as surprised to have won. She acknowledged her parents and staff of the GHS as being instrumental in helping her gain the top spot from among the other seven contestants. to the amusement of the crowd. Browne, who is the daughter of Samuel Browne and Agnes Llewellyn, hopes to become a veterinarian. As one of her prizes for winning the pageant, she will have all her CXC CSEC subject paid for by Equity Chambers. In second place was crowd favourite Miss Dance Hall LaSheika Campbell. The 16-year-old Form 5 Business student had the crowd on her side from the start with her modern and positive depictions of dancehall. She effectively used controversial Jamaican artistes like Movado and Busy Signal to put across her message. She succeeded, if only to get 354 points, the Ivy Joshua trophy for Best Ambassadorial Speech and The Alma Dougan Cultural Wear Award. Third place with 353 points was Shanelle Compton. She was Miss Reggae. The 14-year-old Form 4 Arts student also won the Stacy Peters award for Best Talent. The other contestants were Miss Indian Chutney Felica Thomas, Miss Soukous Karen Jack, Miss Soca Shanell Francis, Miss Calypso Eleisha Clarke and Miss Salsa Shantell Compton. 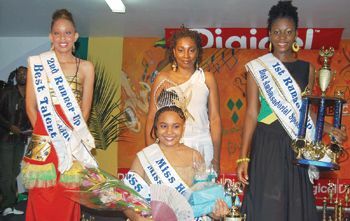 This was the sixth production of the Miss Heritage Pageant. There were performances by local soca artistes Icon, Skarpyon and Madzart. The Masters of Ceremony were Broadcaster and Disc Jockey Galanaire and Lawyer Vynette Frederick. Headmistress of the GHS Andrea Bowman thanked sponsors Digicel and commented that she hopes to have the telecommunications companyâs support in 2009, while Marketing Manager at Digicel Juno DeRoche handed out a number of prizes to the audience which included handsets and phonecards.